It’s been a while since I took a break from rewriting my basic instructions on turning words into stitch patterns. This is the next in the sequence; once I’ve written everything up, I’ll update the old version. You might be asking yourself how to turn a code grid into a stitch pattern after choosing a layout. The first and most obvious thing is that a black and white code grid looks very like a chart for colorwork. Go for it! Just keep in mind that more than five stitches in a row horizontally can be difficult because the strand is too long. Here’s one way to deal with that. Here is another. Another possibility is to substitute a standard chart symbol for each black square. The simplest substitutions are chart symbols for stitches that take up only one square and which aren’t increases or decreases: purl dots, slipped stitches, and the like. Here’s the final version of peace from the previous page with the substitutions made for purl stitches and slipped stitches. This is actually a remarkably useful code grid: it doesn’t cause some of the more common difficulties for many stitches because there are no black squares directly above other black squares. 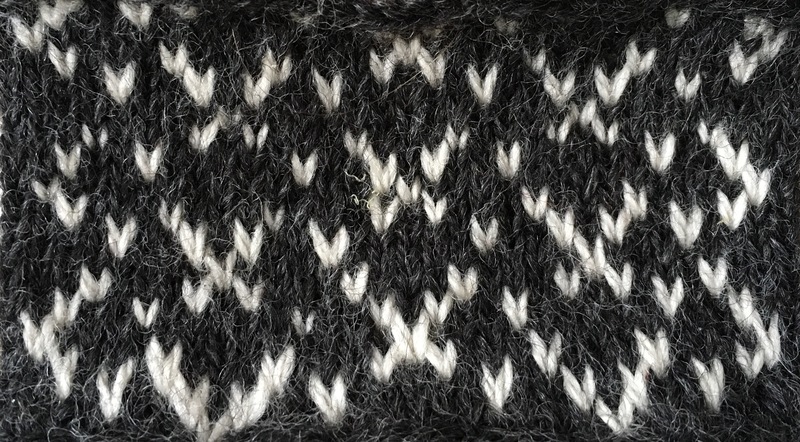 Here is a code grid with vertical lines of black squares – too many of these can cause problems with slipped stitches and purl stitches. The solution is to add alternating plain rows. Another name for this sort of stitch patterns is lace. I have yet to try substituting decreases for the black squares; I find it intimidating. I usually substitute yarnovers for the black squares. The tricky bit is figuring out where to place the corresponding decreases. Sometimes it’s obvious; other times it requires a lot of swatching and trial and error. I’m not going to explain this process here on the blog. Unless you’re comfortable with lace stitches on every row, it’s also necessary to add alternating plain rows. I haven’t yet knit a swatch from this chart, so it might change before it gets added to the final version of these instructions. Hah! And indeed it did. In the end, this turned out not to work so well for lace; this is often the way. (The lace turned into creepy, grinning faces, which is all very well and good if you want creepy, grinning faces. But that’s not very peaceful to my mind.) This is from the code grid labeled “Method 4, 6 columns”. What I think of as a multi-stitch unit is a common stitch pattern maneuver that takes up more than one square on a chart. 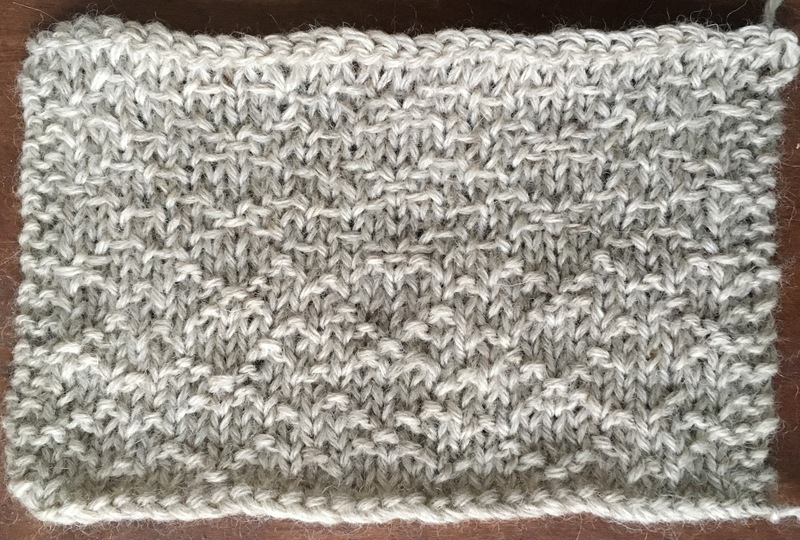 For example, skyp: slip 1, knit 1, yarn over, pass the slipped stitch over. This takes up two spaces on an ordinary chart – it consumes two stitches and creates two stitches. That means it won’t fit in one black square on a code grid. It also needs alternating plain rows. Here’s how to deal with that sort of thing, first shown with a plain small checkerboard that isn’t meant to be a code grid. The key is to figure out how many squares are needed for the stitch maneuver. Skyp requires two columns and two rows, so the key is to subdivide all the squares in the grid accordingly. The fake code grid is on the left: alternating black and white squares on a two-by-two grid. The subdivided version is in the middle: now the chart is four-by-four, but still has the same overall black and white pattern. The final checkerboard chart is on the right. Here is the same peace chart from above subdivided, then turned into a chart with skyp. The red lines indicate the outlines of the multi-grid stitch. Making basic cables with code grids is pretty straightforward: they’re multi-unit stitch patterns. I like to include purl columns as part of the unit. Here’s an example of the peace chart from above with 1/1 cable crosses. It is very occasionally possible to make complex cables that travel across the fabric like this. This is from the first peace grids I ever posted online. (I’ll be taking them down because the overall set wasn’t as good for explanations as the ones I’ve shown here.) However, I got lucky with that first one. I discovered later that it’s pretty unusual to have a code grid that makes that kind of cable work; I am therefore not going to explain the process. Hi! Very interesting thanks! Ihave a question, though. Which software do you use for making your charts? I am starting creating my own design and pen and paperare not enough anymore! I use a program called StitchMastery, which I very much like. There are some other good options as well: Envisionknit (for Windows) has good reviews. Whatever you do, don’t bother with Intwined. I found it terribly buggy, and I know of many people who have had bad experiences with it. There are some web apps as well that are free: Chart Minder and Stitch Fiddle. I’ve sometimes used the former for colorwork in particular. I haven’t tried Stitch Fiddle yet, though I’ve heard good reviews. Another option is to use Excel or another spreadsheet program in combination with a knitting font (you can buy the StitchMastery fonts for this; there are other options as well). There are also apps for tablets, but they tend to be more limited.